Here’s an interesting concept: dry soda. Well, not really. When I first read about this new soda on Weetabix’s post, a powdery mix-in came to mind. Instead, DRY Sodas are all-natural beverages flavored with fruit or herb extracts and gently sweetened with cane sugar. The sodas come in four yummy sounding variations: kumquat, lavender, lemongrass and rhubarb. Actually, lemongrass doesn’t sound that yummy to me, but I’d definitely give the others a go. I was thrown, though, by Weetabix’s categorization of DRY sodas as “diet soda alternatives”. Considering the soda has 50-70 calories per bottle, depending on the flavor, it’s hardly diet… although it’s certainly much better than “regular” sodas. Want to learn more about this intriguing new beverage? 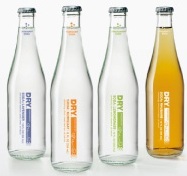 Visit DRY Soda online and read all about it. Entry filed under: clean eating, food review, news around the blogosphere. Tags: diet soda alternatives.